Xikar Element Lighter - A Double-Jet "Flame Thrower"
I was nearing the end of a marathon shopping session with my wife and our friends in Chicago when my buddy and I decided to duck into a cigar shop. A nice selection of cigars was available, but what really caught our eyes was the collection of butane jet lighters and cigar cutters from Xikar. Once you pick up one of these you know it is more than your average lighter. A gentle press of the button flips the cover open and two adjustable bright blue jet flames instantly appear. This will definitely light your cigar or campfire with ease. The jet flame reaches about 2 inched tall and sets fire to anything in its path. Windproof and works in incredibly well in wet conditions. Get wet kindling going in seconds. A fuel gauge and a cigar punch are ingeniously built in features. 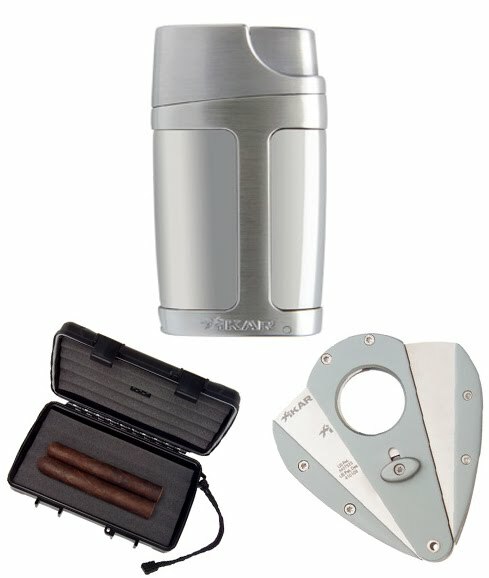 For the more serious cigar fans Xikar has a line of cutters and containers that are equally impressive. The teardrop shaped cutters are razor sharp and come in a wide variety of handle materials and colors. These strong compact cutters clipped a 50 ring gauge cigar in two like there was nothing there. If you have a taste for the exotic, you have to check out the Fossil Mammoth Ivory Cutters. The small travel humidor is durable and light, holds at least 5 cigars and is completely waterproof to make sure they stay safe and dry on the trek in. I will have my Xikar lighter in my pocket on my next trip into the woods. I know I will have fire no matter what Mother Nature throws at me. I will also have perfectly maintained stogies clipped with surgical precision. Possibly a bit unnecessary I admit, but well worth the added ounces in my pack.